Experience pure luxury behind the wheel of a Maybach rental in NYC. Rent a Maybach in New York today and you’ll be nestled into the most legendary luxury car Mercedes has available. Unlike any other luxury car rental experience, this is the top of the line Mercedes-Benz. Don’t just show up to your next big event, arrive in style. Equipped with the finest leather, polished woods, and up-to-date technological gadgets, the interior feels more like a first class flight than a luxury rental car. Enjoy the most luxurious Mercedes-Benz has to offer with this stunning luxury rental car. Our goal is to provide an effortless car rental experience. At first glance, you might think this is just a regular S-Class but it is far from it. For starters, the Maybach S600 has been extended by 8 inches giving the rear passengers even more space to stretch out their legs and relax. Another unique feature not found in any other Mercedes rental is the unique suspension system called Magic Body Control that scans the road ahead adjusting itself to whatever road condition you might encounter. Also standard in the Maybach is the 3-D surround sound system which immerses passengers in an orchestra of sounds. Don’t let the elegant lines of this luxury sedan fool you; performance ratings of the Maybach s600 rival those of exotic sports cars. Under the hood is a six-liter, V-12, 523-horsepower engine, and a seven-speed automatic transmission with paddle shifters. With the power to zoom from 0 to 60 miles per hour in just five seconds, the ride is surprisingly silent, smooth, and elegant. 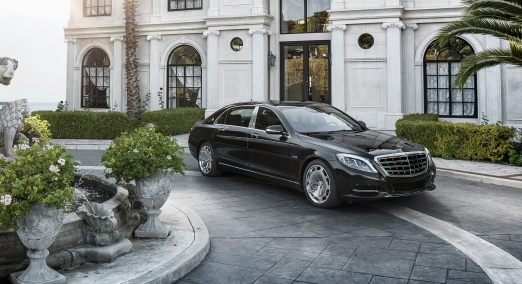 Rent a Maybach s600 in New York today! We can deliver a Maybach rental to anywhere in NYC including Greenwich, New Canaan, Long Island, Rumson, Brooklyn, Manhattan, Montauk, Southampton Beach or New Jersey. We can also provide drop-off services at John F. Kennedy International Airport, LaGuardia Airport or your hotel upon request. The cost to rent a Maybach in New York can vary based on the time of year and availability. The average price can range between $1,495 and $1995 per day. Delivery to New York City is usually around $100 each way. Included in your Maybach rental is 100 miles and each additional mile after that will be $2.95. Drive One of the exclusive and luxurious Mercedes Maybach Vehicles ever produced. If you prefer to be driven we also provide Maybach Chauffer services in NYC. The chauffeur service is a popular choice for Weddings and Prom rental. Whatever option you choose we are happy to answer any questions you might have.